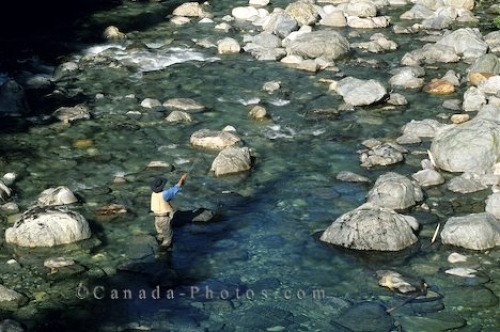 Fly fishing on the West Coast of Vancouver Island, British Columbia, Canada, is amongst the best anywhere in the world. The streams and rivers of the West Coast of Vancouver Island, British Columbia provide fly fishing that compares favourably with the rest of Canada, or indeed the rest of the world. Because of the number of streams like this, a fisherman's success is based solely on his or her abilities. Picture of a man fly fishing, alone with his thoughts, on the West Coast of Vancouver Island, British Columbia, Canada.